But during the performance—after Joseph begged for a room for his pregnant wife—the boy didn’t have the heart to turn him down. Life wasn’t that easy for the soon-to-be-born Jesus. He had many difficulties to face. Knowing full well what would happen, Jesus left his home in heaven and came down to earth in the form of a baby. His destiny would lead him to the cross, where he would die to pay the price for the sins of mankind. It was not an easy task, but it was one that had to be performed in order for us to be saved. “And being found in appearance as a man, he humbled himself by becoming obedient to death—even death on a cross!”—Philippians 2:8. 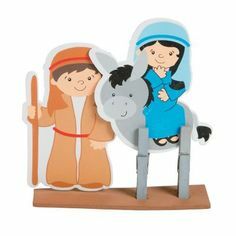 This entry was posted in Christian Living, Communion Meditations, Humor and tagged baby Jesus, humility, illustration, Mary and Joseph, no room at the inn, Philippians 2, sacrifice. Bookmark the permalink.